The most common salt water aquarium eel is the moray, a fish who makes a great centerpiece. Moray eels are big, and many species are colorful. Feeding time is a great opportunity to to see your eel in action or show it off. Just make sure you feed your eel the right way. All eels are predators. Most eels and all morays are ambush predators. This means they get their food by waiting for prey to come by and seizing it with an abrupt, snakelike motion. 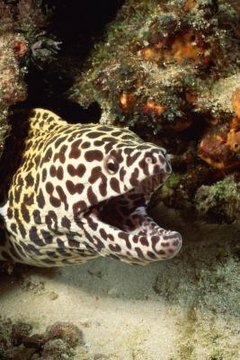 A typical moray's diet includes fish and crustaceans. To a moray eel, cephalopods like squid and octopus are a delicacy. In an aquarium, you should replicate this diet by feeding your moray these items. The subset of moray eels called the pebble-toothed morays are those in the genera Echidna, Gymnomuraena, and Siderea. They include colorful morays like the snowflake and zebra morays. These eels prefer mollusks and other hard-shelled crustaceans rather than fish and cephalopods. These morays are generally regarded as "reef safe," as they rarely harm immobile invertebrates like sea anemones and corals. Feeding your eel allows you to see a glimpse of how eels behave in the wild. Wild-caught eels don't like to eat dead food. Unless you plan on feeding them live food, you will need to train your eel to take food from a feeding stick. A feeding stick is a tube you put food on. Wiggle the food like it's alive and, sooner or later, your eel will learn to associate the stick with food. Feed adult eels once a week and younger, smaller eels twice. You're going to want to avoid hand-feeding. Sticking your hand in the water at all is bad for habitat water quality. Additionally, hand-feeding can be dangerous. Eels have poor eyesight and can tell your hand from food only on a good day. Eel bites can be serious. Eels are not poisonous, but their bites are prone to infection. If your eel bites you, seek immediate medical attention. Do I Have to Feed Torch Coral?